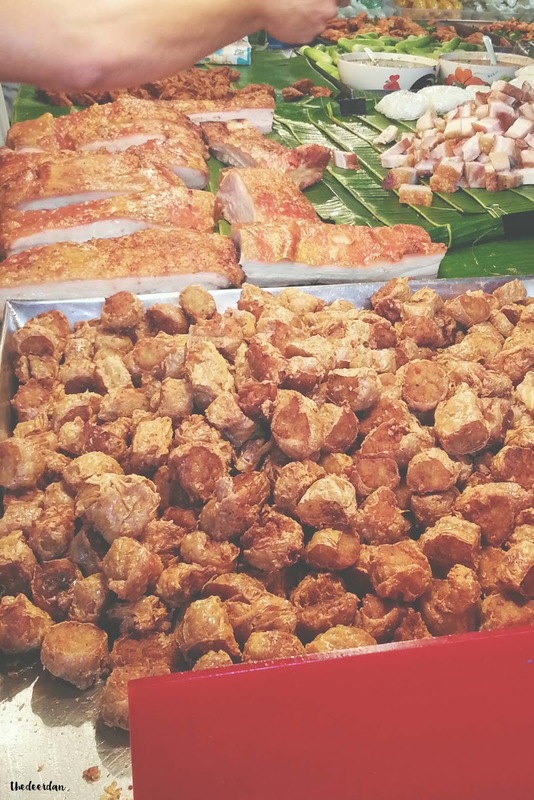 Some kind of prasmanan food in Indonesia? We didn't know what it was and how to name it, a casual food stall near our hostel in Ratchadaphisek ( see location below for the details ) and they serve different food everyday. 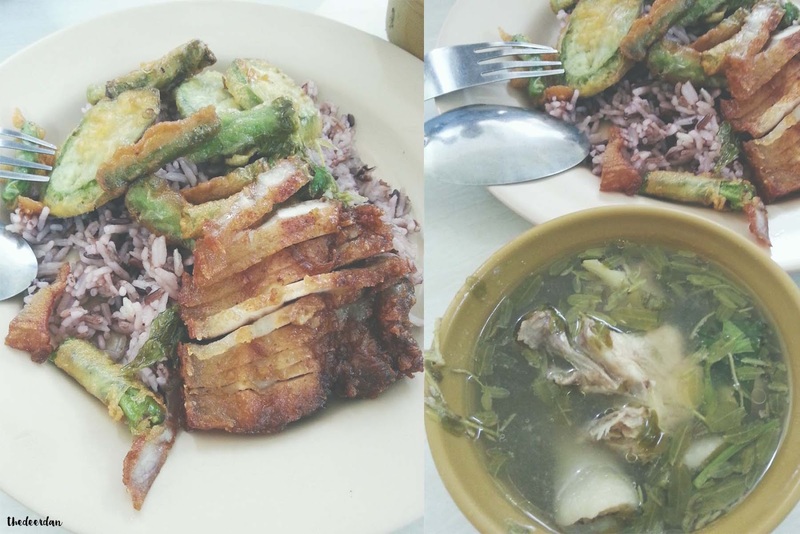 As you can see at the photo above, it contains of Pork Rica, boiled and salted egg and chicken soup. We really amaze at how big and clean the rice was, for a street stall, compared with street stall in our homeland, Yogyakarta. The taste is worth the price. Price : 50 Baht, free sugar less flower tea. 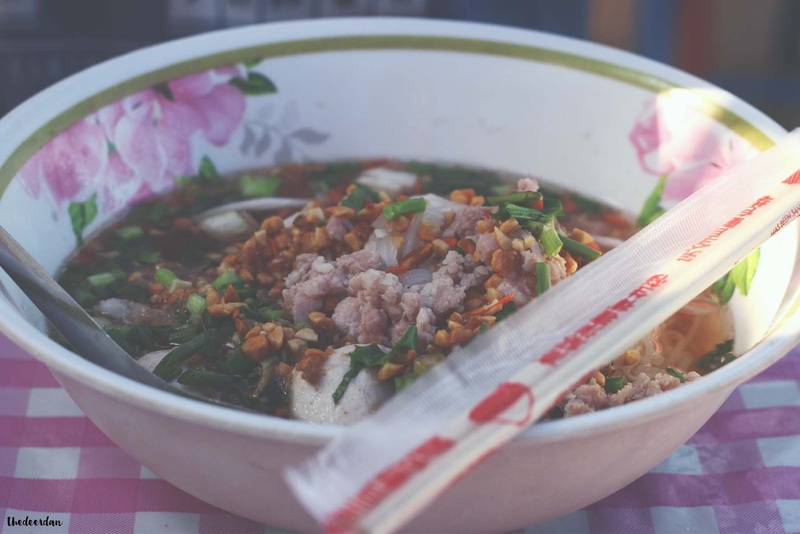 This was our very first breakfast on our first day in Bangkok, we would never forget how delicious it was. The stall had the same concept as the food stall above, but this one had tastier food. It had strong typical Thai seasoning that we've been tasted in every food we ate in Thai. 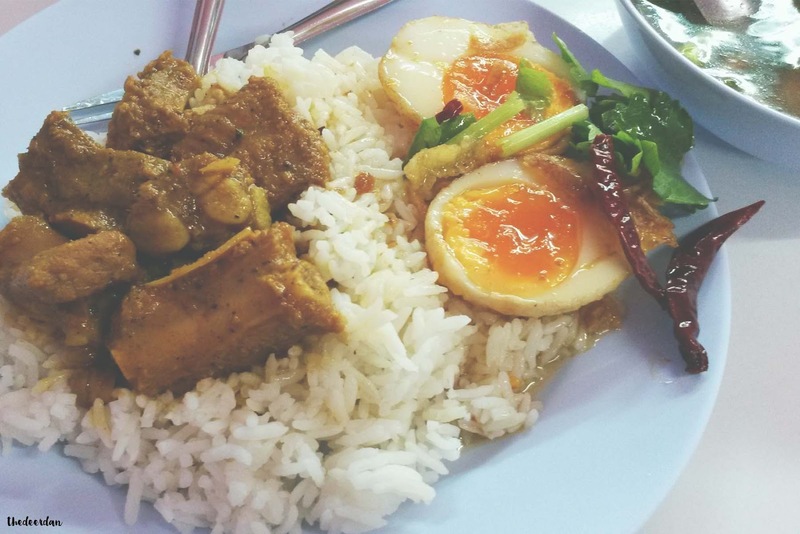 You definitely need to eat this food when you stay near G9 Hostel Bangkok in Mo Chit area. 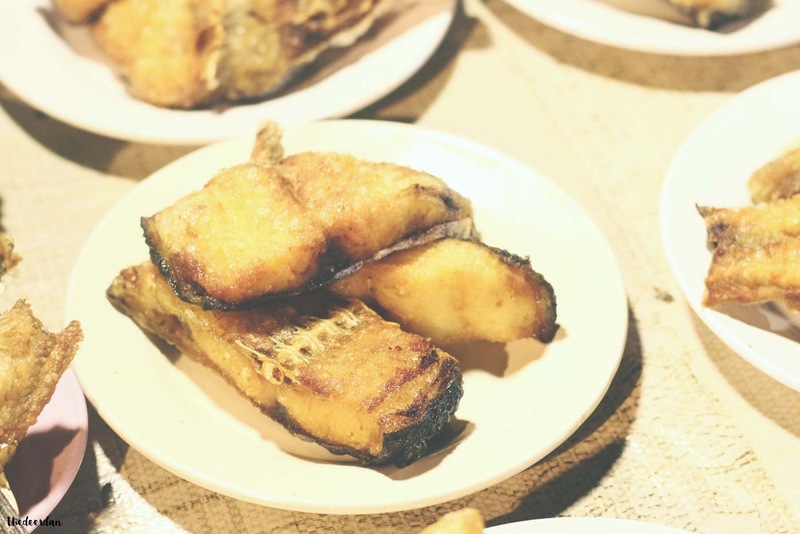 Contains of Chicken soup, fried pork belly, fried long beans and fried eggplant. Price : 40 Baht, free a cup of ice water. Food before going to war. 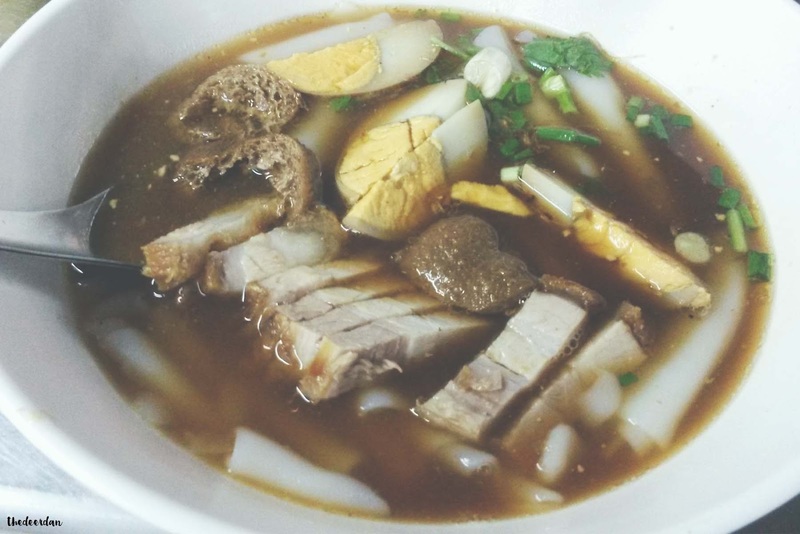 Before going to Chatuchak Weekend Market, it's better for you to take a breakfast first. Since we came on the spot with empty stomach and there were a lot of stores haven't open yet, we did eat first. There were a lot of food stall to stop by in this road, and the food was seemingly had not much different each other. If by chance you stay near Saphan Taksin BTS, or in Glur Bangkok Hostel I recommend you to visit Bangrak Food Bazaar. 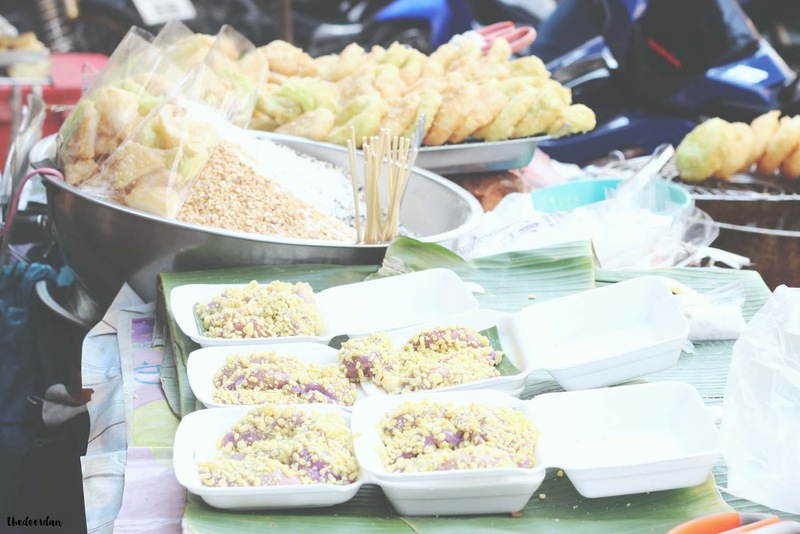 You can find Thai street food and heavy meal there. Open daily from 5PM to 9PM. 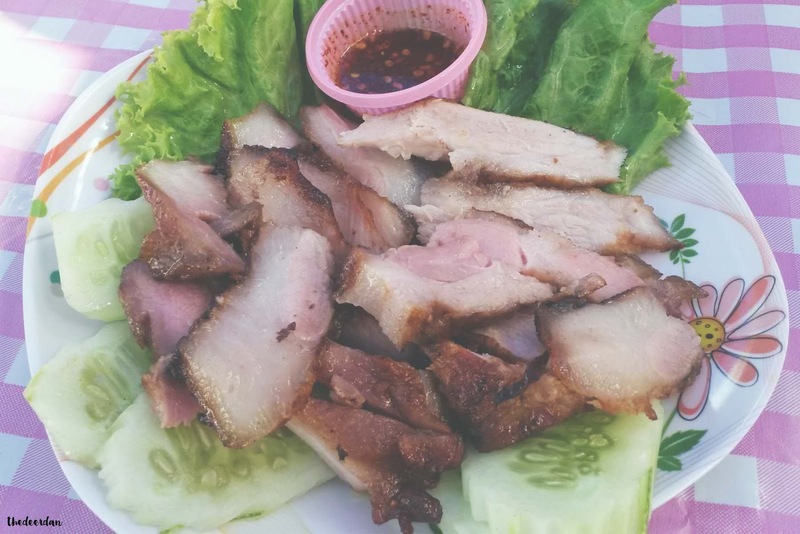 On our last stay in Glur Bangkok, we come back in a late night and only able to taste the grilled pork with herb as seen at the photo above. We never taste this kind of delicious grilled pork in Indonesia, so we really felt in love with this food for how strong the seasoning was. Exploring Wat Pho Temple? Feel so hungry and tired of walking? Good! Quickly find the exit, you will find this food stall outside the temple. As usual, the soup has the typical Thai seasoning and we still didn't know what seasoning it was. 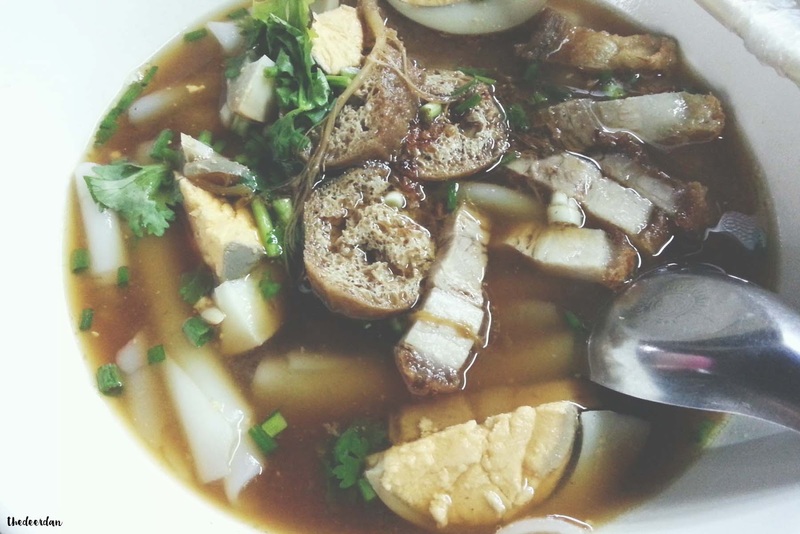 The pork was deliciously succulent and tender, refreshing soup and freaking yummy fish ball. 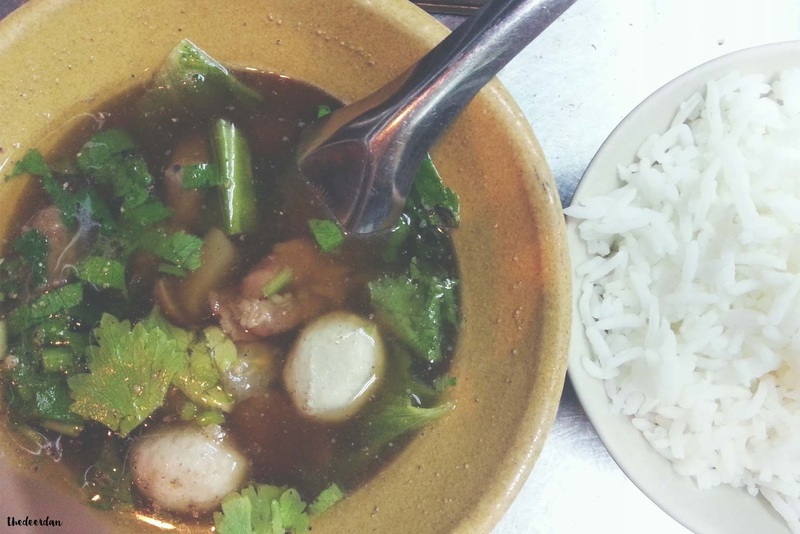 Every time we ate soup in Thai, it felt like drinking a herbal soup with strong ginger. 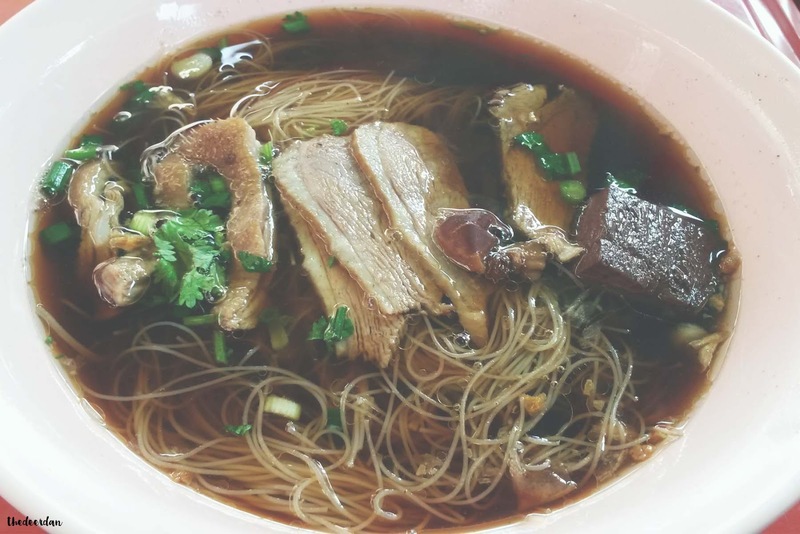 In frustration of looking for Chinatown Bangkok gate, we finally giving up looking for it and stopped by a fancy food truck near the Ratchawong pier and ordered this duck soup. 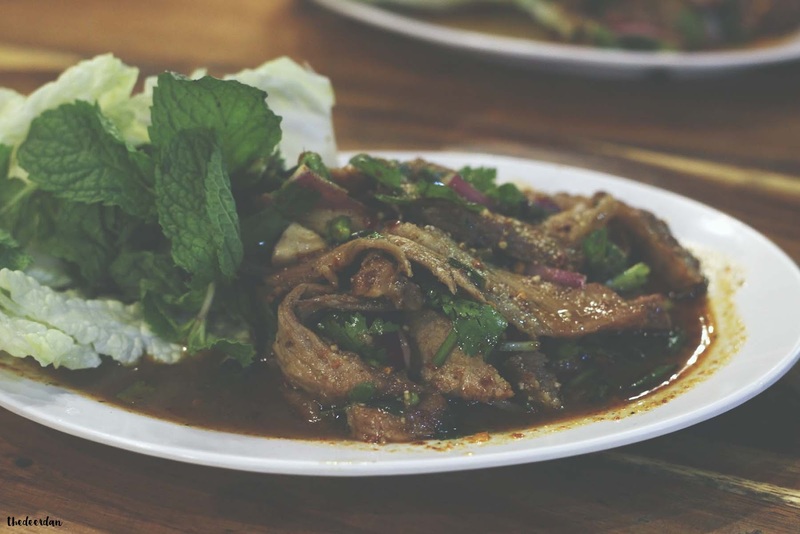 It was overall had the same taste as Stewed Pork soup, but in different meat, why not stop by and taste it? Price : 40 Baht, free sugar less flower tea. Stewed pork with udon, tofu and egg? Yes please! The soup taste the same as the other soup, but presented with udon, stewed tofu, baked pork and boiled egg. The owner of this food stall is so kind and friendly. We really love this area, there were also lots of food option to eat. 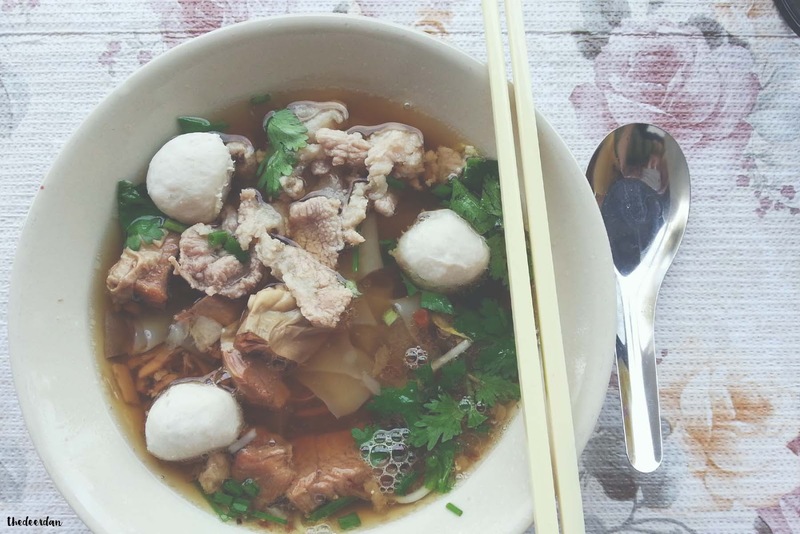 Want to eat Stewed Pork Soup near Bangrak Bazaar? Then you can go here. Still in the same direction with the stewed pork and egg stall above, the exact location is in front of optical store near Robinson Mall. 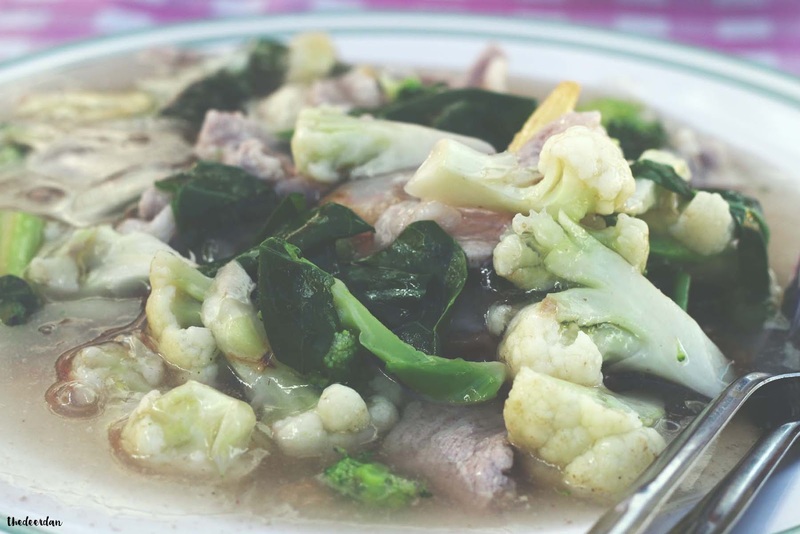 It had exact same present as stewed pork soup we ate at Wat Pho Temple area. But we ate with rice this time. But for me, the soup taste is kinda familiar, like Indonesian meat ball soup :D You might only find this food street after 6PM, they didn't have stall, only cart on street. Price : Standard size 50 baht, Jumbo size 60 Baht, Rice 7 Baht a cup, free ice water. 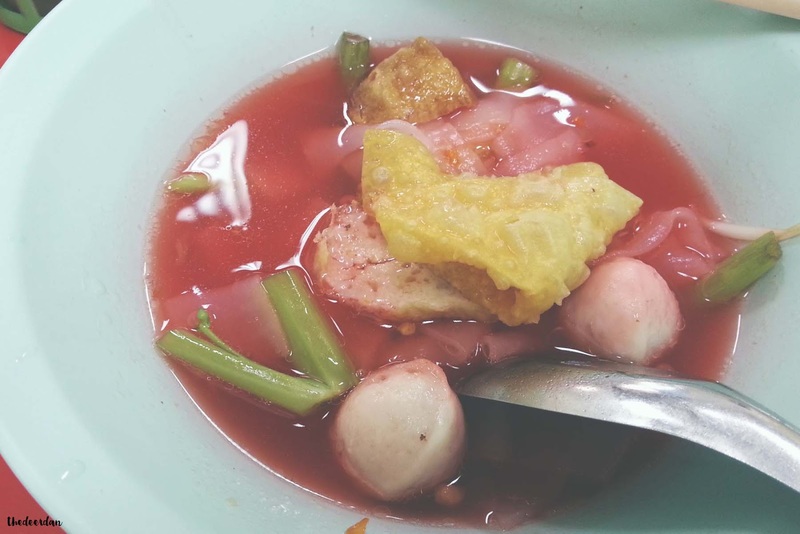 I attracted by the pink color of the soup, and again the taste is kinda familiar, really like Indonesian Meat Ball soup but in Thai strong seasoning. 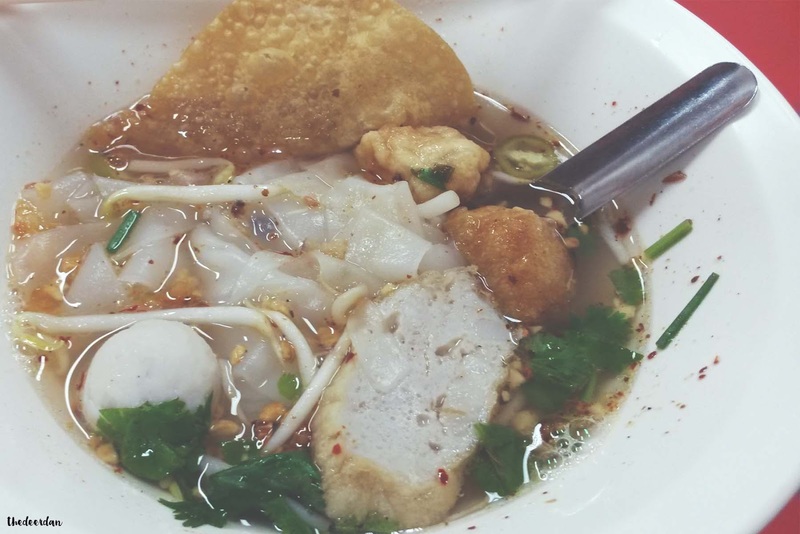 You might better taste the Tom Yum Noodle, the soup was so refreshing with ginger and typical Thai seasoning. 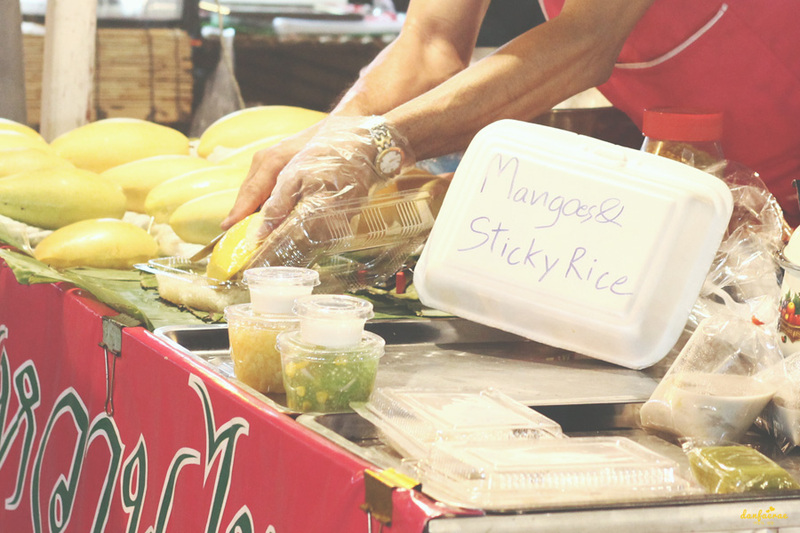 The location was close to Grand Palace entrance gate and usually crowded at noon, so be patient with the extra humid weather in and out of the stall. Price : 40 baht each. 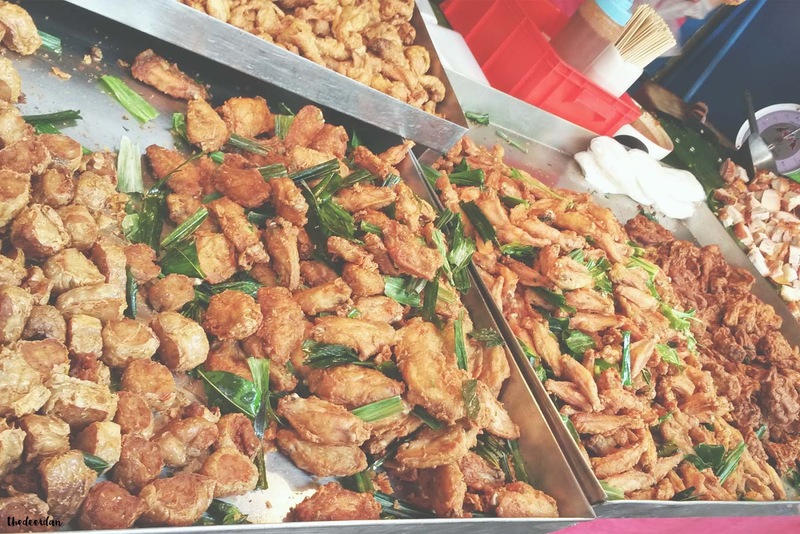 We actually didn't know what it was, I captured this street food in the middle of Chinatown Market, next time visit, I'll definitely try this one! A must try! 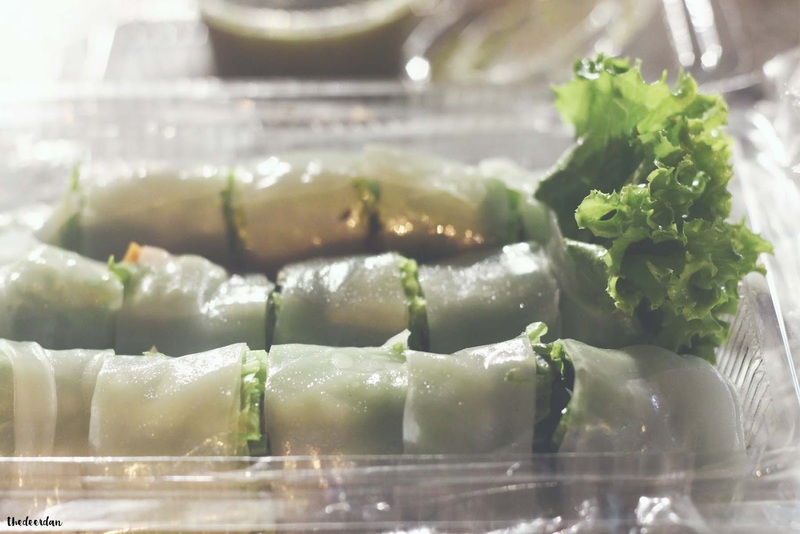 We found this rolls in a food bazaar near Big C Extra Ratchadaphisek. It's not only wrapped the vegetables but meat such as fish ball, fish meat, pork belly, and I forgot :| The one that make it more delicious was the Thai signature chilli. 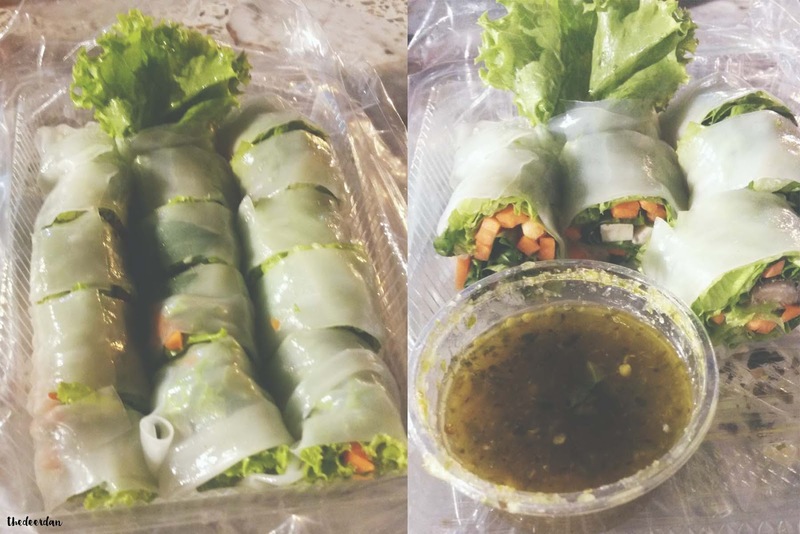 Price : 20 Baht for 3 rolls. 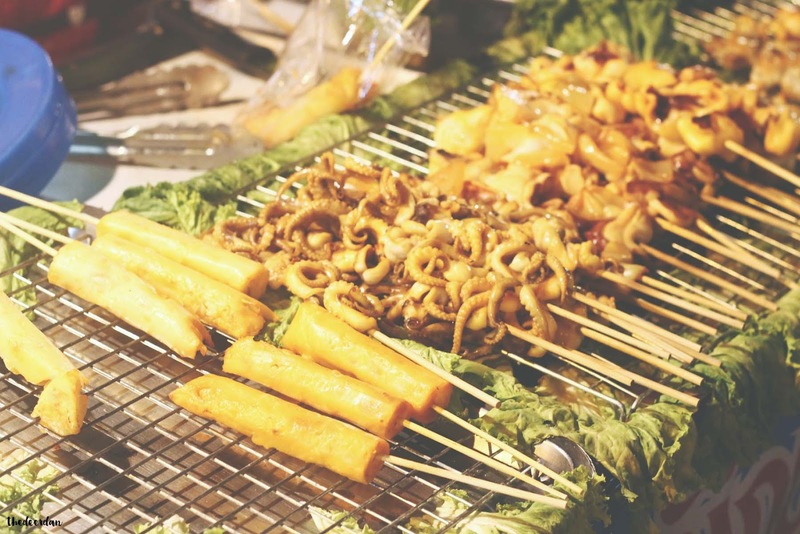 In the same spot as the spring rolls above, you can find this grilled squid and Salt grilled fish. My BF eat this one, we really ate a lot that night, I don't even mind to taste these food due to my stomach overload hahaha. Don't forget to drink Thai Tea here, only 15 baht. Price : 30 Baht each. How could I not stopped by and bought this attractive sio bak? The butterfly in my stomach is definitely dancing! 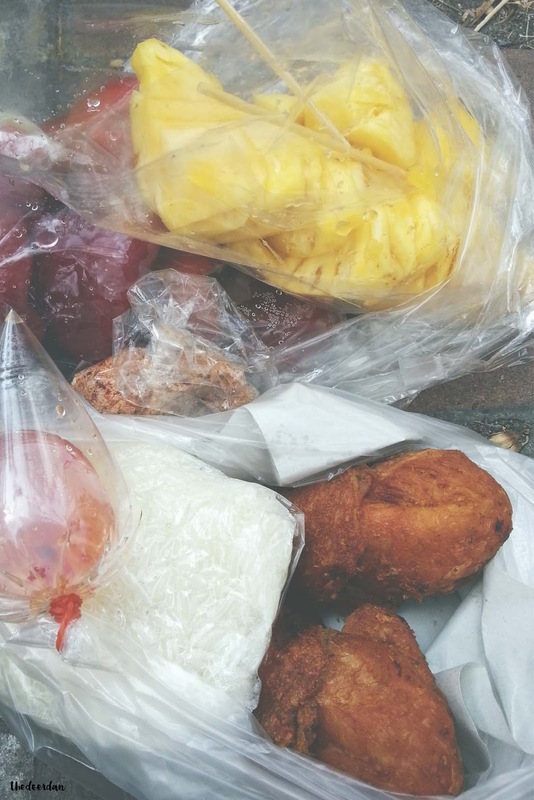 Price : every kind of fruit were usually packed in plastic bag for 20 Baht, 20 Baht for fried chicken and 7 Baht for the sticky rice. Location : Thanon Ratchadaphisek at noon. 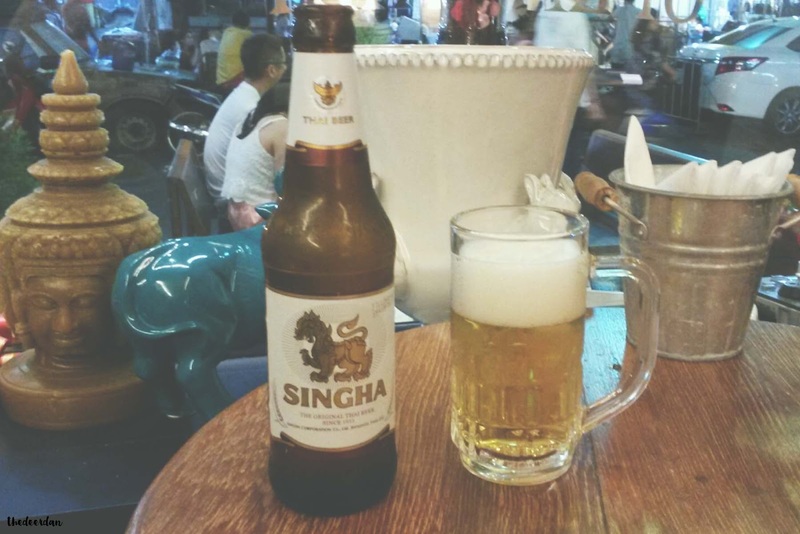 Leo, Chang and Singha beer for a must drink beer in Bangkok. We bought these beer in Glur Bangkok, the price is already markup, if you wanna drink this beer, you can easily find at 7-Eleven store with cheaper price. 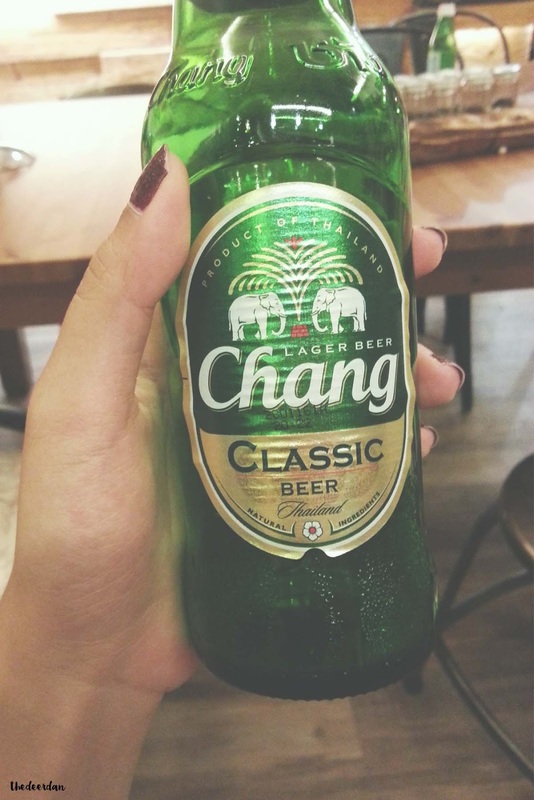 Among the three, Chang beer is my fave. 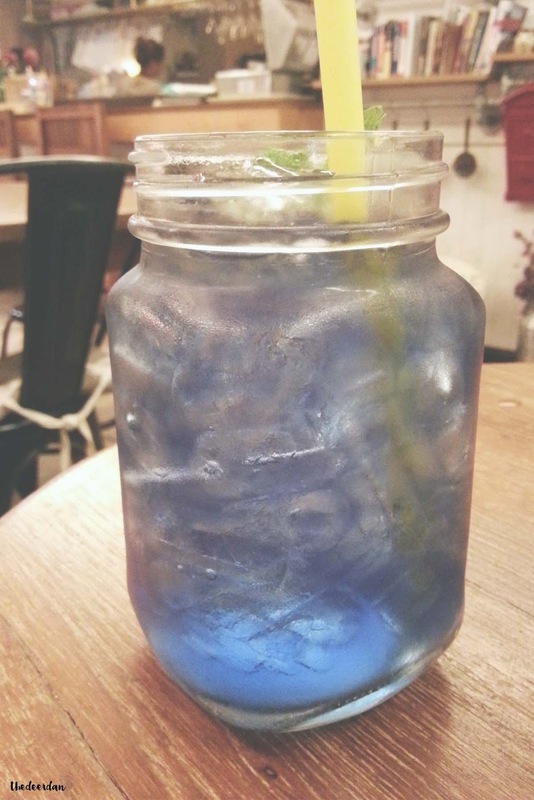 For the butterfly drink, the bartender said it was a herbal drink, I do feel some kind of herb in this drink but couldn't describe it to you, so drink this one whenever you are in Bangkok if you can't drink beer. Price : 90 Baht for the beer, 80 Baht for the butterfly drink. 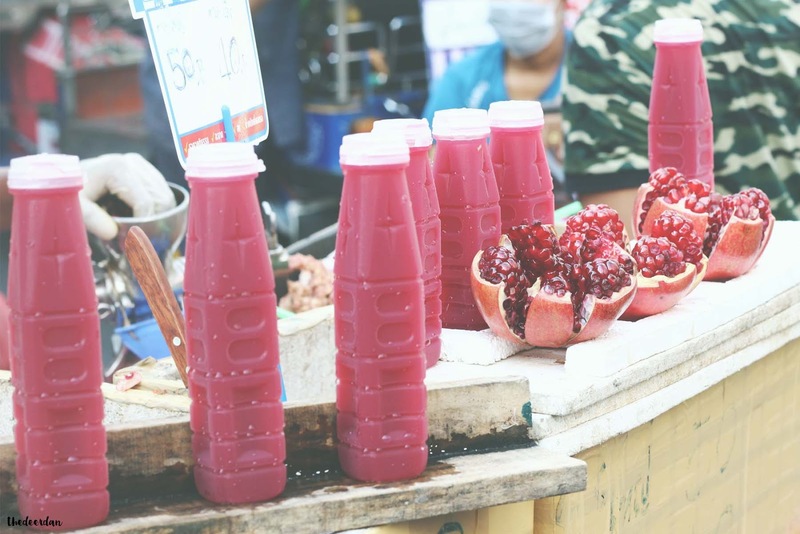 Fruits in Bangkok is the best, especially the juice. One bottle won't be enough. Price : 40 Baht for the small size, 50 Baht for the big one. Location : Everywhere in Bangkok street. 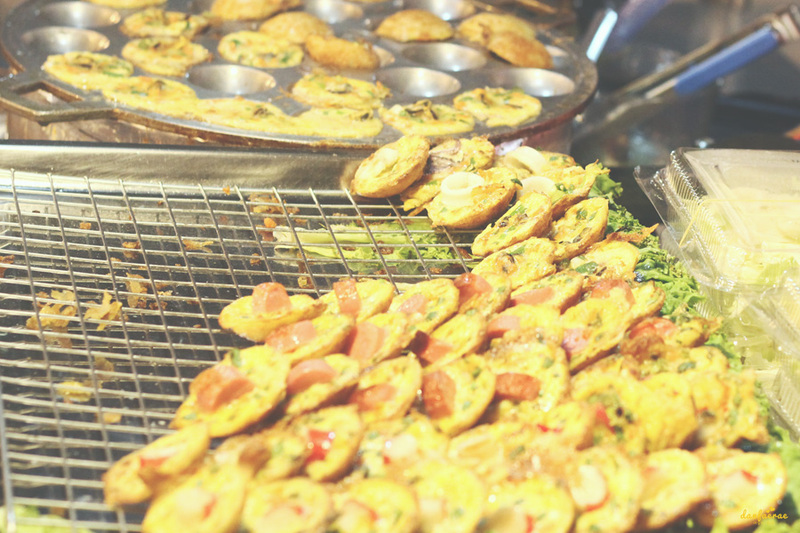 On the first day of our culinary journey, we felt a bit nervous on choosing what best food to eat and which had lower price. 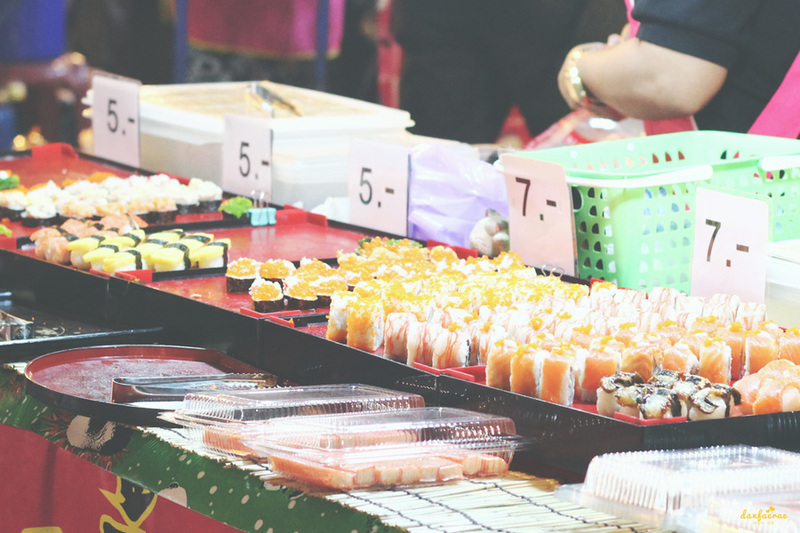 We didn't bring a lot of money and didn't want to spent too much on food so we act a bit picky and always questioning the price of the food first before purchasing. But, day by day, we realize that there wasn't any price differences for local and tourist, the price is all the same. Just because we are a tourist, the seller in Bangkok never mark up the price. There were lots of them put the price list on the big board, so don't worry. Actually, there were a lot of food that we've been tasted but not photographed. I really regret it :( I hope on the next culinary travel post I can give you better and detailed photos.